Wednesday, Detroit Mayor Kwame Kilpatrick announced a detailed, ambitious and thoughtful plan to improve six Detroit neighborhoods. The mayor didn’t say it, but that debate has been raging for about a generation. The discussion became most heated in the 1980s, when Tom Barrow ran unsuccessfully for mayor twice against Coleman Young, charging Young was paying too much attention to developing the central business district at the expense of the rest of Detroit. The irony of the debate was that downtown wasn’t in such great shape itself in the 1980s and for much of the 1990s. The decaying J.L. Hudson building loomed over downtown in those days. Woodward Avenue, home of numerous loft conversions today, was derided as the “wig district” then. The new stadiums, casinos, Compuware Corp. headquarters, Campus Martius and $1 million condos were years away. Downtown Detroit still trails the downtowns of most of big-city America in almost every category, but it’s in better shape than it has been in perhaps 30 years. And the gap between central Detroit — including downtown, Midtown, New Center and the riverfront — and the neighborhoods has grown greater than ever. The imbalance can be striking. There’s more and more money downtown, but increasing poverty in many Detroit neighborhoods. The downtown buildings are well lit, but lots of streetlights and even traffic signals don’t work elsewhere. Police officers ride bicycles around the casinos and stadiums, but there aren’t enough cops to ride the busses. Downtown has a privately financed clean-up squad while the city had to cut back on bulk trash pick-up where most people live. There’s a tremendous effort underway among regional powerbrokers to expand Cobo Hall, mainly so it can continue to host the North American International Auto Show for two weeks every year. But the city has closed recreation centers. Downtown has a handful of organizations devoted to its well-being. Many neighborhoods don’t even have a block club. The difference between downtown and neighborhoods was on display last week, when developers announced the $82-million renovation of another derelict building, the Fort Shelby Hotel, which will become a Hilton Doubletree. Almost simultaneously, the Free Press reported on some days up to 25 percent of the Detroit Fire Department’s rigs are out of service or running with serious malfunctions. Fox-2 TV recently reported similar equipment problems with the city’s EMS fleet. As an issue, neighborhood preservation in Detroit is more than 50 years old. In the late 1950s, 22 percent of the homes within Grand Boulevard were vacant, according to a University of Michigan study at the time. In 1962, the city’s planning department reported that about 15 percent of all land in Detroit was in some stage of blight. Today, blight continues to invade new areas. The condition of neighborhoods — and the schools — are driving the black middle and working class out of Detroit. The city’s population is currently estimated at 845,656, a drop of 105,614 (or 11 percent) since the 2000 U.S. Census. “Clearly there are going to be more losses in the future,” said Jim Rogers, a demographer for the Southeast Michigan Council of Governments. The imbalance between downtown and neighborhoods is partly due to Detroit’s never-ending budget crisis. Kilpatrick doesn’t agree that neighborhood conditions are all that bad, but with his new plan, he is trying to bridge the gap between central Detroit and the rest of the city, starting with six neighborhoods. 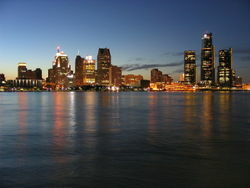 The project to be announced today is the latest in a long line of ideas to save parts of Detroit. Kilpatrick knows that. This one is different, he maintains. He used words like “revolutionary.” “Big.” Good. That’s the extent of the problem. Copyright © 2007 Detroit Free Press Inc.
~ by Keith A. Owens on May 16, 2007. I know downtowns needs to be world class & thats all good but Detroit has neglected the hoods for the longest. I love going downtown but when I actually go up into the city, I am like WTF is really going on. It will be really interesting to see how this hood development goes. Shouldn’t Life Be More Than This?